Air conditioning provides cooling, but the latest technology means it can do so much more, meaning there is more opportunity for installers to solve indoor air problems for homeowners. Jody Lees, LG’s Head of Air Conditioning and Energy Solutions, explains. Air conditioning in homes is not perceived as an immediately prolific market in the UK, living as we do in a climate that requires cooler air more rarely. However, LG is experiencing a steady increase in demand for domestic air conditioning products here, and not always simply driven by the desire for cooler air – although the number of warm, sticky nights in the year when air conditioning would be a wonderful addition to our homes is on the rise. Despite not being a mass market in the highly temperate UK, the sales of fans through the sheds seems to back the theory that almost without realising it, we are as a nation looking to cool down far more. Much of the demand for air conditioning in UK homes is for higher end new build properties, but equally there is demand from people who are not necessarily looking just or even primarily for cooler air – but for better air quality. This includes a removal of the moisture out of the air, reducing the humidity levels associated with warm spells in the UK, for filtered air removing the allergens from the air that cause havoc for hay fever and asthma sufferers, for people living in urban areas where opening windows to cool down lets in noise pollution and provides a security issue, and of course the fact that most air conditioning units can also provide quick response heating as well. There’s a real choice of domestic air conditioning equipment available now in the UK – from designer wall mounted systems through to bespoke whole house systems. 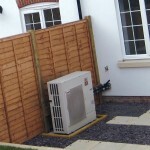 And whilst the term air conditioning immediately gets associated with cooling, the majority of units available these days can provide heating through heat pump technology, making them an all year round investment – not one just for a few weeks a year when the air temperature and associated humidity levels become stifling. The demand for air conditioning units is definitely on the rise. This is particularly true of upmarket properties where we see the majority of domestic air conditioning systems installed. If you are involved in a new build or refurbishment project for a luxury property, the owners will be happy to see as many value added features included as possible, and a quality air conditioning system will qualify. As with many items in a building project, if you incorporate the air conditioning system at the time of the build you will considerably reduce the cost of the installation over retrofitting it at a later date. Importantly air conditioning – as well as providing cooling and heating – can also address humidity, and if there is someone in the family that will be living in the home that suffers from allergies, an air conditioning system is a great way to filter allergens out of the air. You can set the system up to make it exactly what you want it to be, meeting your own very personal requirements. One of the vital requirements of an air conditioning system in the home is the ability to control it simply, so it’s a good idea to choose a manufacturer that has a worldwide reputation for electronics and one for designing simple to use remote controls. Despite the huge range of electronic control systems that are available, one of the main reasons for call outs to faulty air conditioning and heating systems is still an inability of the property owners to understand how to use the controls. 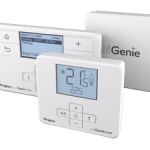 Whilst some manage well, many older people in particular tend to struggle to use complex electronic, multi-function controls – we’ve all heard the story regularly that grandparents need school aged grandchildren to be able to operate the TV, and air conditioning and heating controls offer the same issues. So it’s a major plus to get a system that comes with a very simple remote controller that is truly user friendly. It’s worth checking these out with the homeowner before deciding on the system you are going to install. Modern air conditioning systems have managed to evolve to lose the noise problem that early systems undoubtedly had. Modern motor and fan technology can see the sound levels as low as 19dB – whisper quiet. Impressively, these systems can deliver up to 60% energy savings over comparable older units as well, being extremely energy efficient compared to earlier systems. How the system looks is also important in this day and age. There’s a growing demand in domestic air conditioning units for them to blend almost seamlessly into the decor of the home by using ducted indoor units, or even to enhance it with aesthetically pleasing wall mounted units that actually form part of the decor. This kind of unit offers a totally different air conditioning experience and provides a focal point for a room that moves air conditioning onto a different plane. It could include the addition of calming LED lighting that can change colour and even offer a calming Smart Alarm that gradually wakes the homeowner in the morning with a lighting effect that mimics the rising sun. It says everything about where domestic air conditioning is moving to as we develop new and intelligent systems that can form a vital part of the services for a home in the 21st century. So air conditioning is an option for installers looking for additional income streams and business areas to expand into.